All it took was the right tool. 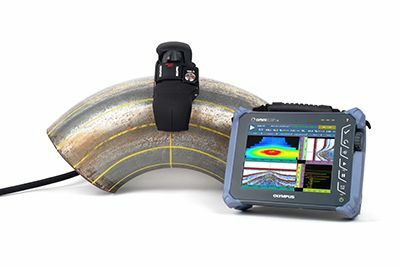 The FlexoFORM™ scanner was specifically designed to solve the problems that arise when inspecting pipe elbows with ultrasound. The FlexoFORM inspection solution lives up to its name. 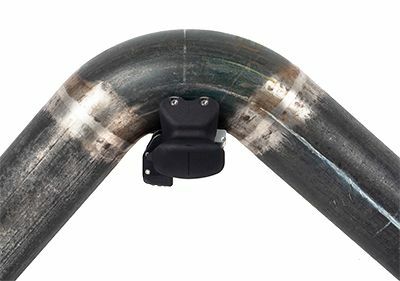 The ergonomic shape is not just pleasing to the eye — incorporating our flexible array probe technology, the FlexoFORM scanner solution can map corrosion in pipe elbows from 4.5 in. OD and up. First, you choose the water wedge that fits your pipe diameter, and then you insert the flexible probe inside it, which curves the array, so it stays concentric to the pipe’s surface. The changing shape of pipe elbows from convex on the extrados (outside curve) to concave on the intrados (inside curve) is normally a major challenge for ultrasonic surface mapping. However, each of the FlexoFORM scanner’s wedges contains a foam gasket that contours to the pipe’s inner and outer curves, maintaining a steady water column and helping ensure a reliable signal. Inspectors spend hours drawing grids on elbows to use as a reference so the location of indications can be approximately indicated in their report. The FlexoFORM solution has an encoder that maps the scan axis of the pipe and an indexing button, located right on the scanner, to increment the index axis. Lines can be drawn in one direction to provide a path to follow on the scan axis, but they’re not always necessary. Depending on the level of precision required for your inspection, you may not need to draw lines at all. Because of the way the magnetic wheels are positioned, the solution naturally follows the centerline of the pipe elbow as you scan, so minimal guidance is required to keep it on track. An 8.6 in. OD elbow can be completely inspected in as little as 2 minutes. A grid drawn on a pipe elbow for UT spot checking without the FlexoFORM scanner. 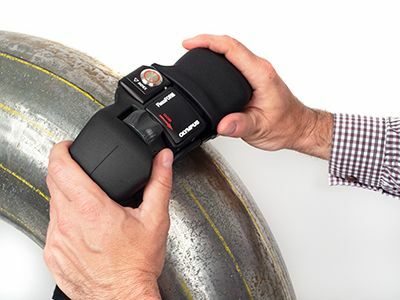 With the FlexoFORM scanner, drawing a grid on a pipe elbow is no longer necessary. All data points are stored in one file to generate a clear C-scan image of the entire surface of the pipe elbow, so the locations of indications are easy to determine. The high-resolution data (as high as 1 mm × 1 mm) facilitates the analysis of damage and anomalies, such as remaining wall thickness, corrosion pitting, and mid-wall lamination or inclusions. A complete picture of the pipe elbow makes it easier to diagnose what mechanism is causing the damage and to determine the repair or maintenance strategy. 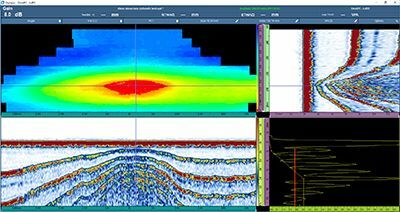 In this way, the FlexoFORM scanner is an indispensable tool not only for evaluating remaining operation life but also for helping prolong the extended life operation of pipes in plants. For added flexibility, a water wedge series is available for pipes as small as 1.3 in. OD (and up to 4 in. OD). SFA1-Small wedges can be fitted with a Mini-Wheel™ encoder to perform one-line scans of pipes or the extrados of pipe elbows. The SFA1-AUTO wedge series can be used with our MapROVER™ scanner to perform automated scanning in the longitudinal direction on pipes of 8.6 in. OD and up, as well as flat surfaces.